If you thought you would never be able to afford your own kayak, think again. 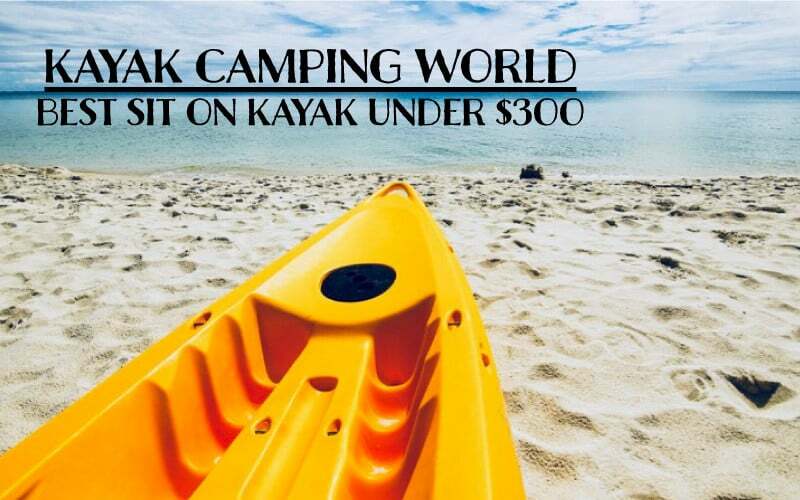 Here are the Top 3 best sit on top kayaks for under $300! The Lifetime company has been around since 1986. They manufacture a variety of things including, sit on kayaks, paddleboards, paddles and more. 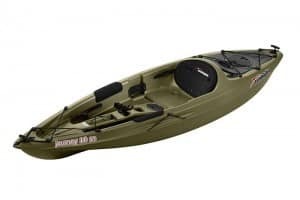 The Lifetime Lotus™ is an 8 ft. adult kayak with a 250 lb. weight limit. Blue, UV-Protected Polyethylene construction with self-bailing scupper holes. Scupper holes are used to drain water from the cockpit area. There is also a drain plug at the rear of the kayak to drain any water that got inside. Weighing only 38 lbs. and having a center carry handle, makes loading, unloading and carrying your kayak much easier. It also has front and rear T-Handles if you have 2 people. The seatback has a quick release and is adjustable. There are multiple footrest positions for different size people. Being a sit on top kayak, however, your feet can rest virtually anywhere. There is storage at the rear that uses bungees to secure your gear. It tracks well for a beginner kayak and has good stability. This model also comes with a 5-year limited warranty. The Lifetime Lotus Kayak has everything except the life jacket, you, and some water. Check prices for the Lifetime Lotus Kayak. The Sun Dolphin Camino 8 SS comes from Sun Dolphin Boats in Michigan. They began by making pedal boats in 1982 and now produce kayaks, canoes, pedal boats, paddleboards, Jon boats and more. I think it’s safe to say they know what they’re doing now. A key benefit to the Camino is the larger, square stern that offers extra stability. The adjustable seat is padded for comfort on long paddles. There is a storage compartment between where your legs go, but keep in mind, it is not completely watertight. It also has the graduated footwells for various size people. 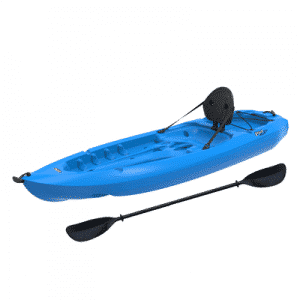 The Camino is 8 ft. and is available in 3 colors, Ocean Blue, Red, and Tangerine. It weighs roughly 40 lbs. and has a capacity of 225 lbs. OK, this one is my favorite. This is the Journey 10 ss fishing kayak. Yes, I said fishing kayak. Does it mean you have to fish with it? No. However, if you do plan on fishing, this is the one to get! As with the Camino ss, this is made by Sun Dolphin. The Journey 10ss is 10 ft. and available in 2 colors, olive or tan. It is slightly heavier, weighing 44 lbs. However, the added features it has makes this a small sacrifice. It does have a weight capacity of 250 lbs. Great for carrying more gear and equipment. Unlike the other 2, the Journey’s footrests are adjustable, so finding the perfect position is simple. The seatback is padded and adjustable as well. The storage on this kayak is excellent. There are front and rear storage wells for buckets or crates. Sun Dolphin calls it P.A.C., portable accessory carrier, but I call it “more room for my crap”. It is a watertight sealed storage compartment in the rear of the kayak that features shock cord rigging. Very nice feature in my opinion. If you are the fishing type, you’ll love the options for holding your fishing rod. There is a swivel mount rod holder between your legs and 2 flush mount rear rod holders. That’s a lot of options for your rods. Also has a large bottle holder area between the legs. This is a good, stable boat for paddling around the lake catching some bass. The storage options and fishing features give this one a thumbs up from me. 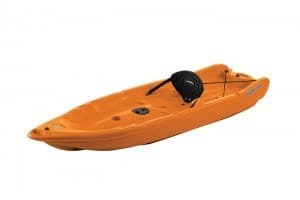 Check prices for the Sun Dolphin Journey Fishing Kayak. So, Which is the Best Sit on Top Kayak? All 3 of these sit on top kayaks are perfect for a beginner adult or teen. They are stable and track fairly well. It’s recommended to kayak on calm water with any of these. That really narrows it down to personal preference. Maybe you’re like me and will enjoy the added benefits of the fishing kayak. 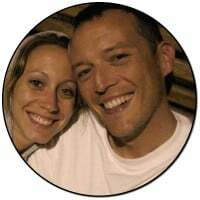 Or you’re more like my wife, who chooses based on the closest color to pink. I’m pretty sure you’ll be happy with any of these!